Hi, I am starting on my shower this weekend and I'd like to get some feedback on my shower wall plan. I bought a fiberglass shower pan and framed in two side walls. The back wall is the side of the bus and I took out the windows and covered with sheet metal, then insulation and 3/4” ply. I will put up concrete backer board and then I would like to “tile” the walls with vinyl plank flooring by gluing the planks to the backer board using construction adhesive. I was going to use Gorilla Glue adhesive as it is pretty strong. Vinyl plank is pretty water proof on its own and I expect to have short showers and lots of ventilation to keep down the moisture. When I went to Home Depot, the flooring guy there cautioned against using vinyl plank and said he thought the glue wouldn’t hold. He laid out a whole plan using tile but once he left, I rethought and put everything back as it seemed to be so many steps and so much weight. Does anyone think it is possible to use vinyl plank and construction adhesive? My second choice would be metal roofing panels. Lots of kinds of construction adhesives out there. Find one that's water resistant. I hung all the tile on my fireplace surround with liquid nails. I've just finished making my shower, and I've tiled it with Armstrong vinyl Peel&Stick floor tiles. Knowing that their own adhesive would not be enough to hold them on a vertical surface, I first used Loctite polyurethane construction adhesive on them but it reacted badly with the tiles' own adhesive and softened it so much that they all fell down. No bueno. I next used a Roberts pressure-sensitive flooring adhesive (I can't remember which one, but it was water-based) on the advice of a flooring sales dude at Home Despot, but again the tiles all slipped down because the Roberts adhesive always remains slightly soft. Muy no bueno. Attempt three uses Weldwood contact cement (the real one with psychotropic fumes, not the emasculated water-based one) that slightly reacts with the tiles' own adhesive but not enough to affect their adhesion on the wall. It's the best way I've found so far, and the tiles don't creep down the wall but can still be gently pried off if they ever need to be replaced. I used vinyl tiles because my shower walls are not perfectly flat, so using vinyl planks wouldn't work for me. Armstrong, needless to say, couldn't recommend anything for what I was doing, so I've done my own empirical DIY trials of what works and what doesn't. Interestingly the same tiles straight on the stainless-steel shower pan floor stick so well to it with only their own adhesive that they're impossible to remove without breaking them into small chunks. I think part of my problem is because I use Poly-Tex plastic on the side walls as a waterproof backing against the wall's plywood, and the plastic is inherently difficult to glue anything to because it's a polyethylene-type of low surface energy plastic; the tiles adhere just fine against the FRP on the back wall because it uses a different plastic which bonds better with adhesives. It's been a LOT of work to do my shower this way, but it looks really good, so for me it's worth the trials and tribulations of what I've gone through. Doing a trial on adhesive types sounds like a good idea. I will do that first. Then... those tiles began 'unsticking'. I kept pressing them back down. I eventually took 'other measures' (which is a horrible solution and I am too embarrassed to detail) to get them to stay - at least until I come up with another plan. Overall, I give myself and the approach a failing grade. 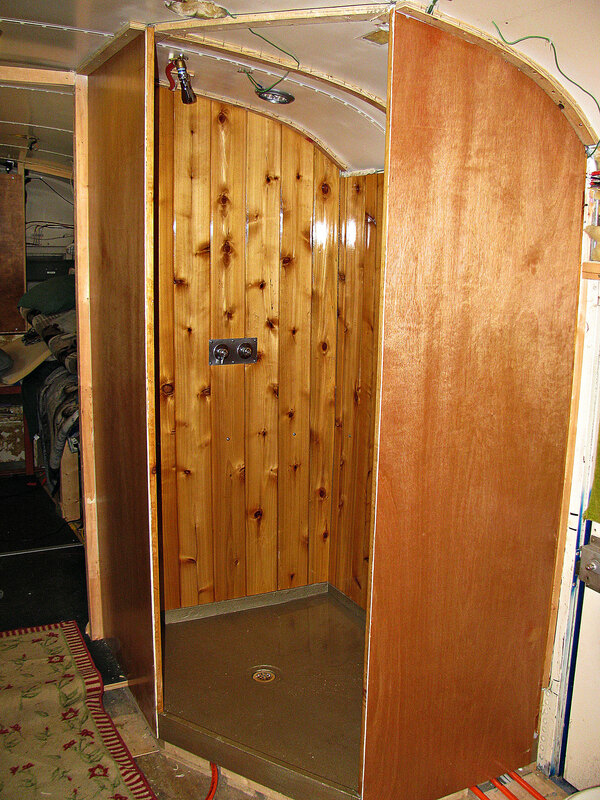 My shower is tongue and groove redwood, glued into a panel then 3 coats of polyurethane. Been holding up for 4 years now. Outer two walls have luan glued on one side. Light fixture is made of same stuff. There's no shame in duct tape. I used fiber-reinforced plastic on my shower walls. Used the Tight Bond FRP adhesive. This stuff is water based and $25.00 a gallon at Home Despot. As a note: I would not ever recommend anyone use sheets of FRP on a curved ceiling surface with multiple joining angles unless you have some other-worldly carpentry skills. It was a major pain and not worth the effort. The flat wall surfaces went up fast, sealed tight to the wall and have a clean appearance (in my mind). The adhesive was easy to work with and cheap. Will see how long this plastic lasts. 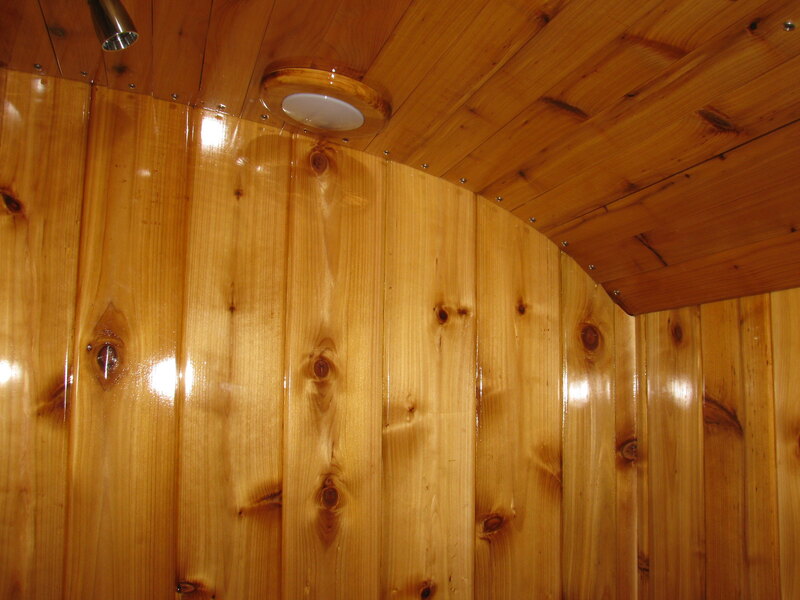 We used an RV tub surround that we glued to the plywood wall. After sitting for the winter, a month before we have to move in for good, we found that it had separated from the wall and developed a foot long break. We're going to try to fix the crack with fiberglass and then use outdoor, extreme temperature, gorilla glue adhesive and hope that it works. It would be really nice if we could figure out what kind of plastic the surround is made of, since that will make a difference in how well the glue works, but we haven't been able to find that information. This is also my plan. For even medium sized showers, it takes just three sheets and you're done. Did you bother with RedGard or simply adhere the FRP to the plywood walls? I'm considering using these panels for the ceiling as well (with spray insulation between them and the metal roof, with wooden stringers to attach to) as they reflect light, are thin, won't absorb any moisture from propane use or showers, don't contribute significantly to heat loss, and are flexible enough to bend to the small roof curve on our Collins bus. I'd use the more flat/less textured side for the ceiling if I go through this.